Is there anything quite as dynamic as a good old-fashioned road trip? No matter the starting point, adventure lies everywhere on the route to Key West. This spring there was a geographical fusion, effectively extending the spring rally fun by both time and miles. Marathon Coach Florida’s Pre-Rally was the perfect jumping off point for pleasure and rejuvenation before the Marathon Club’s “Fantastic Florida Keys” rally began. April 26, the official start of the “Spring Fling,” greeted attendees with house-made biscuits, steaming frittata, cheese and strawberry sweet bread, gourmet coffee and other decadent treats. Soon after, Marathon Coach Owner and President Steve Schoellhorn and Prevost Business Development Director Steve Zeigler addressed the crowd, responding to questions along the way. After the technical session that followed, everyone set out for a “Not-So-Amazing” Race adventure in Dade City. 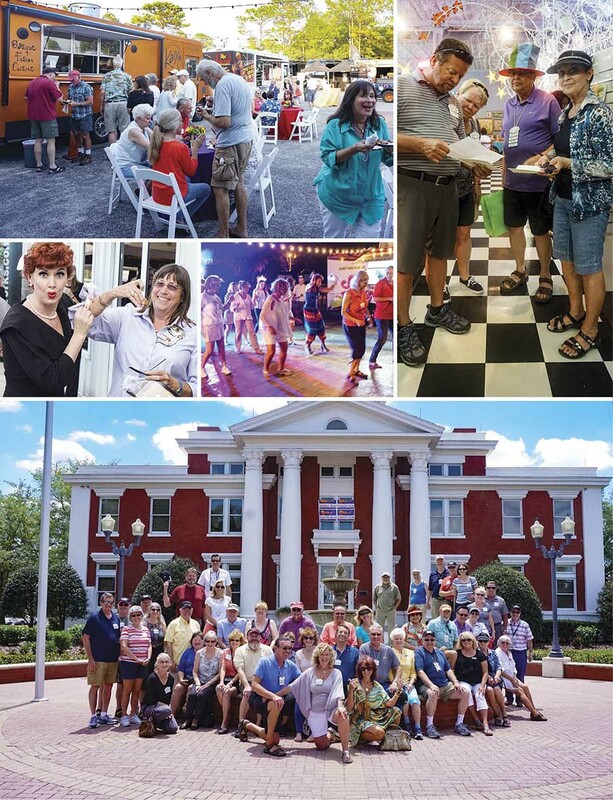 Captains donned in whimsical hats led their teams through the picturesque town as clues guided them to many of the area’s finest shops, including Another Man’s Treasure, Flint Creek Outfitters, Angel Tea Room, Dog Mania and Cats, Quilts on Plum Lane and Lunch on Limoges. Although there were plenty of laughs at the races, it was but a precursor to the laughter incited at the “Havana Night” event, which featured Steve’s close friends Lucy and Ricky Ricardo. From slapstick dancing to playing nurse’s aide to attendees, these characters stole the show as live music rang through the facility and Tabanero Cigars rolled stogies for the group. Thursday delivered another delicious breakfast, followed by a guided ATV adventure and blackjack tournament. The day culminated in an enchanting, festive Florida street party. From street performers juggling glass globes to psychics sharing eerily accurate insights to numerous food trucks laced together with festive lights, this was an affair to remember. Early the next morning, the rally caravan was on its way to the southernmost tip of Florida for the April 30-May 6 “Fantastic Florida Keys” rally. The ever-present sun and laid-back atmosphere shape the cast of characters of Key West today as much as Ernest Hemingway ever did. From talented musicians, artists and chefs to tour guides, trolley drivers and baristas, they all have a story. As rally goers arrived at Bluewater Key RV Resort, iguanas scurried across the sun-baked asphalt and the tall palms swayed lazily in the breeze. Those with bay front lots luxuriated in lovely views and immediate access to snorkeling and swimming, while others enjoyed the convenience and intimacy of the resort’s canal and tropical lots. 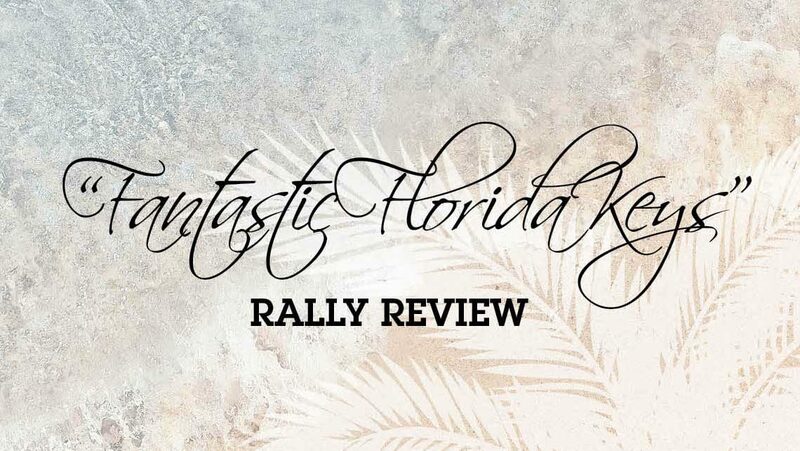 Although Monday morning sent attendees in different directions, with some heading to the Board of Directors’ Meeting at the resort’s clubhouse and others exploring the area in anticipation of another great rally kickoff, the evening brought everyone together. 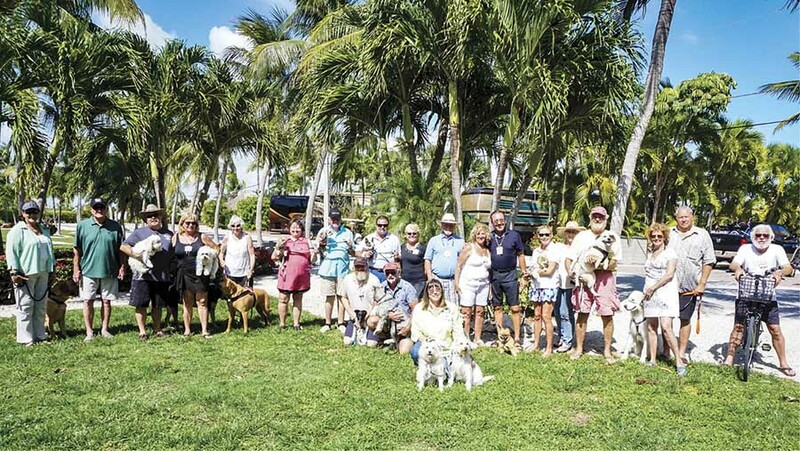 Before the 5 p.m. First-Timers’ social, those with dogs created a pet parade as they made a beeline for the resort’s dog park for a group photo brimming with wagging tails. Soon after, steel drums, a well-stocked bar and passed appetizers welcomed the First-Timers and their Rally Buddies at the resort’s clubhouse. By 5:30 other attendees arrived, visiting the upper level bar or roaming poolside. The “island buffet” wowed the crowd with the dessert trio, featuring black bottom key lime pie, chocolate lava milk and strawberry shortcake. 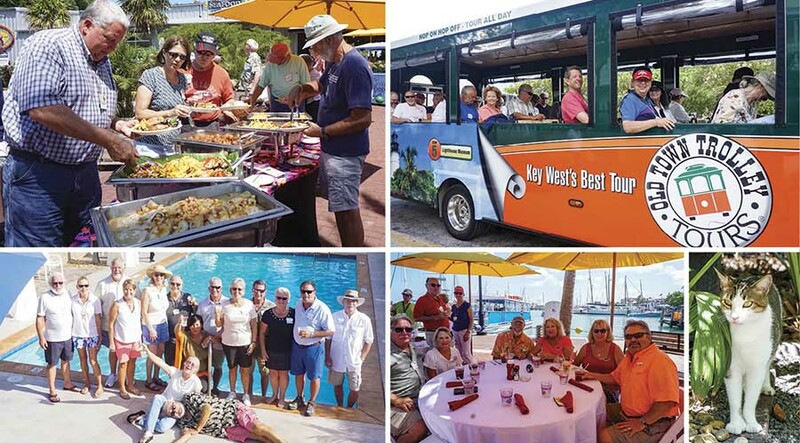 After the Club’s 2017 Spring General Business Meeting on Tuesday morning, rally goers hopped on quaint Old Town Trolleys for an informative tour of Key West. 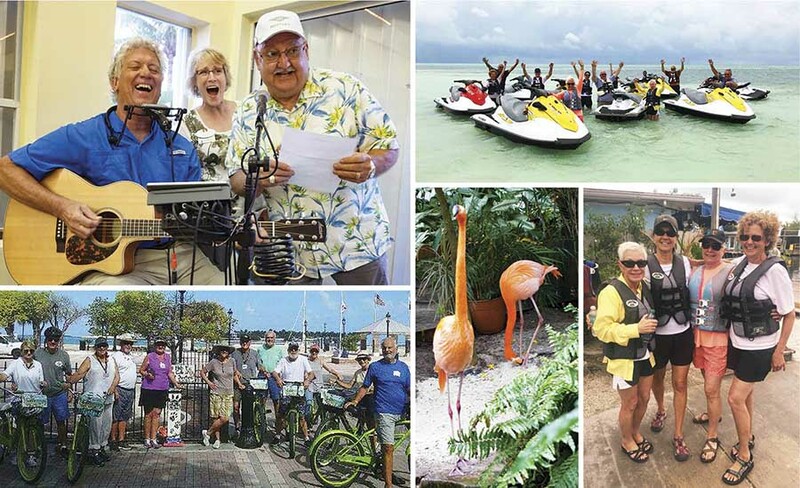 Along the two-lane roads, historical facts flooded the PA system as a plethora of stimulating sights flashed by; the group soon stopped at a waterfront buffet overflowing with local delicacies on the brickyard terrace of the Conch Republic Seafood Company. No one left hungry with the mountains of island-style conch fritters, Key West pink shrimp, key lime pie and so much more. With a walkabout being the best cure for over-indulgence, after lunch everyone broke into groups and headed to their scheduled tour. Literature fans made their way to Ernest Hemingway’s house to walk his halls, see his studio and interact with the descendants of his six-toed cat, Snow White. Others opted for a peek of the Harry S. Truman Little White House, while still others went to the Mel Fisher Maritime Museum, a nationally recognized research and archaeology institution, brimming with genuine treasure. Before catching the transportation trolley back to the resort, many sought the city’s soul, winding their way down Duval Street to Mallory Square, the commercial hub where Key West’s party has no beginning and no end. Wednesday found attendees chasing sunshine and adventure in separate directions. Some pedaled through paradise taking in many of Key West’s star attractions and historical landmarks on cruiser bicycles with Key Lime Bike Tours. Others began their day with a serene, eco-kayak tour with Lazy Dog Adventures. Paddling through the sun kissed water, those on the excursion encountered a school of nurse sharks, a manatee, sea hare, queen conch and more. Rally goers who sought a generous dose of early morning adrenaline chose the Jet Ski water adventure with Key West Water Tours. Fast moving and full of excitement, this activity was awe-inspiring with participants gliding over both the Gulf of Mexico and the Atlantic Ocean at 40 miles per hour. Everyone reconvened Wednesday evening at The Square Grouper. It is easy to understand why locals frequent this restaurant, but for this dinner, it was Marathon exclusive. It was more than just the remarkably fresh, local seafood with an innovative twist that made the visit to this spot on Cudjoe Key special: It was also the proprietor. Early on, Owner and Chef Lynn Bell wooed the crowd, sharing her passion for food, the Keys, her staff and her restaurant’s namesake. Lynn’s key lime pie and key lime martini were two items not to be missed, and attendees all around could be heard raving about the parmesan dusted yellowtail snapper, the Key West pink shrimp pasta with key lime butter sauce and the prime rib au jus. Very early Thursday morning, most of the group boarded the Yankee Freedom III Ferry, traveling 70 miles from Key West to visit Dry Tortugas National Park, one of the country’s largest 19th century forts. Although the island is now known as an ideal day trip, this natural paradise was once a devastating and formidable place to spend time: It was used as a prison during the Civil War. Lack of water combined with abundant heat and humidity, few supplies and less to do made everyday life a burden for the inhabitants, including Navy officers and troops, general laborers, and of course, slaves and prisoners. 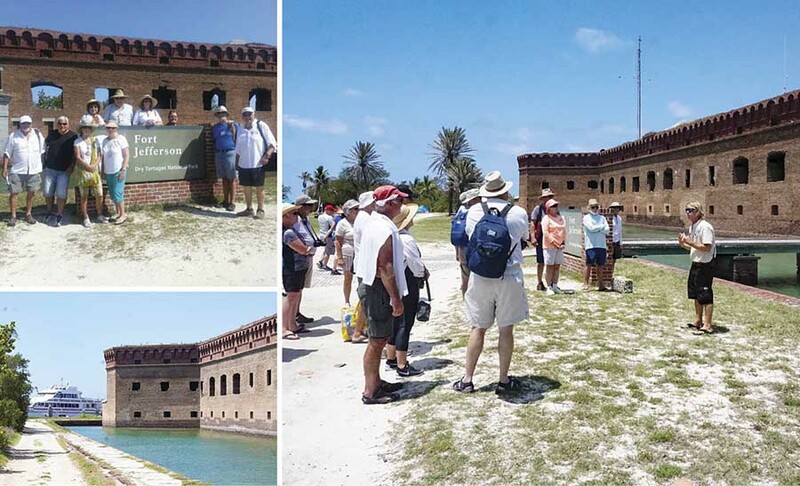 Upon arrival at the park, most attendees chose to take the history-rich tour of Fort Jefferson with the ferry’s Naturalist, “Hollywood,” nicknamed for his charismatic personality. Many returned to the boat occasionally to take shelter from the sun or to enjoy a wholesome lunch. Others spent free time snorkeling, taking photos or learning about the native birds. On the return trip, the bar was a popular destination when it opened at 2 p.m. Attendees engaged in a variety of activities: some visited, other napped and a few played cards and games. No matter what people were up to, when attendee Sylvie Boivin won the grand prize in the ship-wide raffle, everyone cheered. 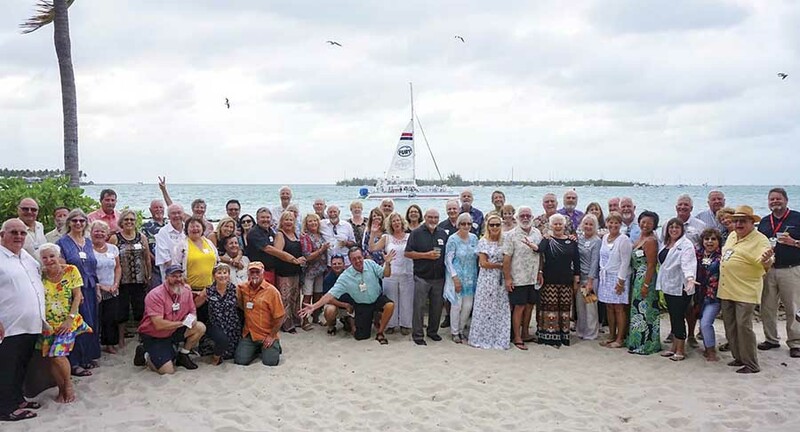 A handful of other attendees chose to forgo the Dry Tortugas excursion, spending the day instead “fun-fishing” and sightseeing on the 28-foot “Inspiration” with Dream Catcher Charters. After thorough on-board lessons, this group of six found that fishing in Key West isn’t that challenging with Captain Paulette at the helm taking them where the fish were plentiful. Friday morning was all about flexibility and camaraderie when a storm blew in, cancelling the group’s reef snorkeling activity. Redirecting their attention, the group disembarked the boat, taking their trolley directly to the Banana Cafe for a lively breakfast before returning to the resort to prepare for an afternoon filled with “on-your-own” activities: chasing happy hour at happening spots such as Margaritaville and the Green Parrot Bar; seeking history at the Key West Lighthouse Museum, Ernest Hemingway’s Home, Harry S. Truman Little White House or the Mel Fisher Maritime Museum; or experiencing beauty in the Key West Butterfly and Nature Conservatory. The rally’s final evening was spent savoring breathtaking scenery, top-shelf cocktails and decadent dishes on the private beach terrace at Pier House Resort & Spa in Key West. Grilled filet mignon served with blue crab-stuffed Florida lobster tail was the most popular dish of the evening. However, those who ordered the plantain-crusted Mahi Mahi or the stuffed chicken breast were also very happy. After dinner, many couples took “selfies” as sailboats and vintage ships floated by on the water behind the beach terrace, while others danced the night away. Inspired by the talented Island Time Steel Drum Band, a lively, unforgettable and undeniably fun conga line broke out before the evening ended. Drenched in sunshine with an emphasis on signature experiences, delectable food, legendary views and a group who knows how to embrace adventure, after the rally concluded, it was no surprise that many attendees found that the “Fantastic Florida Keys” had settled into their systems to stay for a spell.